Toronto, from its humble beginning as Muddy York, has emerged as an exemplary, world-class city. As the 4th largest urban area in North America, it is a treasure trove of obscure, trend-setting Canadian places. Ranked as one of the world's leading places to live, it represents home to almost 20% of Canada's population. Toronto has become the nation's capital of business, culture, sports and entertainment. A place where you can take in the best of all sports, especially hockey, live music, art, and an award-winning culinary scene, all in a weekend. The city's strength and roots come from its diverse population. Toronto takes from its indigenous and British past, a welcoming and collaborative twist on this dynamic multicultural city. Toronto has been described as a city within a green space. Hike inner city trails along the many ravines. Ride in a canoe or skate along the water's edges. Take the longest streetcar ride in North America through flourishing neighborhoods, full of hidden gems to discover. Find the small artisanal ice creameries, wander the graffiti alleys, or make music at a karaoke cocktail lounge. Explore the allure of the 6ix, with 111 Places in Toronto That You Must Not Miss. That almost-instant trust and rapport quickly grew into a friendship and they are part of the reason Schatzberg's sittings with Dylan work so successfully and are so important. Dylan is relaxed, he's funny, he takes the props that the photographer gives him and has fun with them - he's obviously not taking himself too seriously. Working and socializing together, Schatzberg would eventually do nine more photo shoots with Dylan from 1965-6, arguably the singer's most creative period, and capture the (now) Nobel laureate during one of the most pivotal moments in music history. Part of their uniqueness is their basic broad range of intimate and public locations: music and photography studios, live performances and street portraits. But more than that, each session (including the one for possibly his greatest album, 'Blonde on Blonde') says something different about Dylan, the man and the musician, and manages to perfectly capture the many facets of one of the most unique, complex and mysterious individuals of all time. Terry O'Neill is one of the greatest living photographers today, with work displayed and exhibited at first-class museums and fine-art galleries worldwide. His iconic images of Frank Sinatra, The Beatles, Brigitte Bardot, Faye Dunaway, and David Bowie - to name but a few - are instantly recognisable across the globe. Now, for the first time, O'Neill selects a range of images from his extensive archive of "vintage prints", which will surprise and delight collectors and photography lovers alike. There are no rules, and even less justice. Death takes everyone without discrimination. Sometimes it is accidental - like Signorelli, who fell from scaffolding. Sometimes it is expected, as with the diabetic Cezanne, who wrote "I am old, sick, and I swore to die while painting". But often, researching a painter's death is an easier task than determining which of their works is truly their 'last'. Paintings tend to be dated by year and not month, inciting much debate among art historians. This book embraces this ambiguity, studying 100 examples of works that lay completed for several years, or were left unfinished on the easel, or were finished post-mortem by a friend's grieving hand. The Last Painting collects 100 terminal paintings from 100 artists, including Dalí, Manet, Toulouse-Lautrec, Degas, Goya, Pollock, Rembrandt, Dix, Bonnard, Titien, and many more. Each picture gives us a glimpse into the painter's mind. Did they know death was coming? Did they paint with denial, or acceptance? Did they return to a favourite subject, or decide to embark on a new, original project while they still had time? A poetic and thought-provoking book, The Last Painting is a sensitive exploration of the relationship between art and death. On the morning of Thursday, September 12, 1963, noted fashion photographer Norman Parkinson was to photograph a young pop group from Liverpool. Earlier that year, the band had exploded onto the scene - releasing the first of eleven (out of twelve) studio albums that would reach number one on the charts. That band was The Beatles. The album had been 'Please Please Me', it was still number one and it would stay at number one for thirty weeks. Parkinson, already established as Britain's most famous photographer, had a date with its new greatest band. Revealing, insightful and funny this collection of photos captures The Beatles near the start of their spectacular career. Their creativity is plain to see in these photos which have become some of the most important in the extensive Beatles catalogue. Now, ACC Editions, in collaboration with The Norman Parkinson Archive and Iconic Images, presents this historic meeting between a new music group and one of the greatest photographers of the 20th century. Covering nearly 30 rolls of film, these images of The Beatles at the President Hotel in Bloomsbury and famed Abbey Road Studios, offer a rare insight of the making of an iconic band. In the middle of the twentieth century, Pierre Desfontaines, cousin of Louis Ernest Ladurée, created the first Ladurée macaron by having the genius to stick two macaron cookies together and fill them with a flavorful ganache. Ever since then, the preparation has stayed the same. Each season Ladurée celebrates this little round cake that's crispy outside and soft inside, a perfect balance of aromas and textures, by creating new flavors. Each year the palette of flavors and colors grows, from the classic chocolate or raspberry to festive macarons, exotic flavours for certain destinations, fashion designers, perfumes etc. 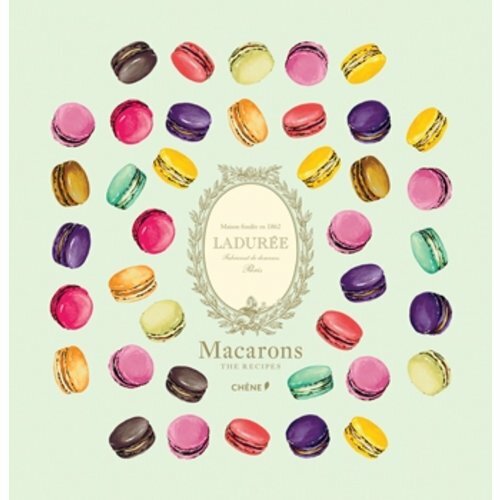 This book presents, for the first time, each of the eighty Ladurée macarons, their aromas, inspirations, trend books and of course all of the recipes to make them at home.At the end of the book there is a practical, step-by-step section to show exactly how Ladurée's chefs make the cookies and the ganache fillings so you can be sure to succeed in making them too. Contents: Introduction: A little history of the macaron; 80 Macarons: flavour by flavour, a trend book, inspirations and recipes for each; 1. Classic macarons (vanilla, café, chocolate, lemon etc); 2. Nomad macarons (created for specific destinations); 3. Festive macarons (Christmas, Easter etc); 4. Precious macarons (gold, silver, copper etc); 5. Incredible macarons (violet, lemon-lime etc); 6. Designer's macarons (berry for Christian Lacroix, fig-date for Christian Louboutin, rose-ginger for John Galliano, bubble-gum for Alber Elbaz etc); Step-by-step photographs and instructions for making the biscuits and ganache fillings at home.